Philadelphia has the hoagie. New England calls it a grinder. And New Yorkers order a hero—basically the same stuffed-to-the-gills Italian-deli meat, cheese, and vegetable sandwich as the other two. So where did the moniker come from? Supposedly in the 1930s, a New York Herald Tribune food writer commented that only a hero could finish off such a massive concoction. And the name stuck. You don’t see as many signs for heroes anymore, now that the city has been infiltrated by so many Subways and other chain sandwich shops. But one place the name survives is at Manganaro’s Heroboy on Ninth Avenue in the 40s. The photo above was taken there in the 1960s. That’s comedy duo Marty Allen and Steve Rossi holding the ends of a six-footer for a photo op. This entry was posted on March 21, 2009 at 4:13 am and is filed under Bars and restaurants, Hell's Kitchen. You can follow any responses to this entry through the RSS 2.0 feed. You can leave a response, or trackback from your own site. Most of New England does not call it a grinder. It’s called a sub. I have only know this sandwich by it;s NYC name, “HERO”!. I have heard it called a “hoagie”, “bomber”, “sub”. But no matter where I have travelled or lived, I always refer to it as HERO! I have been chided in upstaste New York (Rochester, Buffalo, Albany) for referring to this sandwich as a HERO. As a bornh & bred New Yorker, I felt it was my god-annointed duty to educate these “upstaters” and inform them that the moniker they atteched to the “sub” was incorrect and the proper moniker was “HERO”! 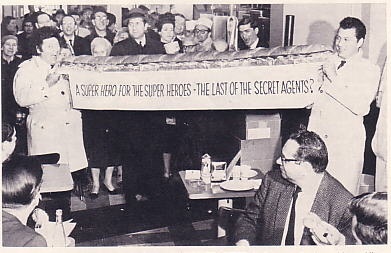 Needless to say, the “upstaters” did not take to kindly to a “city-slicker” coming upstate and telling them that their beloved “hoagies” were in fact “HEROES”! They did not budge and neither did I. In fact, just to piss them off, I would order a HERO with a New York City attitude; you know, “Yo, lemme git a HERO wit da works”! Lol! I hope they didn’t spit in his HERO. eric: Everybody hates Newyorkers?Funny its where all of the stars want to live, NYC is basiacally the hub of all bussiness trading,it has the smartest and talented work force then almost any U.S. city.If you can make it there you can make it anywhere Yeah that song was sung for NEWYORK ,not your crappy state.Believe me where ever you are from your one step behind a new yorker. Then why is it you all end up in Florida complaining about how New York is so much better?…. Stay in New York!! We love our slow life here in the South…. The west coast says, it’s a meat and cheese sandwich on a bun. Who cares what you call it. Throw some avocado and sprouts on on it and you have a gnarly sandwich dude!! By all accounts, this type of sandwich has been around for a great many years, consequently acquiring nicknames along the way. The actual name, “Hoagie”, became its “official” moniker in late Spring, 1954, as my group made a connection between our desire for a sub sandwich and what had happened the previous late night incident where an officer of the Camp Hill Police Dept, a Lt. Hoag, had chased a bunch of us kids just having a good time at a local park. It was past the park’s curfew hour, and the officer discharged his weapon and detained a few of the unfortunate ones. Camp Hill is a suburb of Harrisburg, Pennsylvania. Personally I was a distant observer along with my girlfriend. We all made a joke of the whole incident and decided to go to Castiglia’s Restaurant in Harrisburg and celebrate with a Hoagie in deference to the officer who had made a fool of himself the night before. Hence, the Hoagie” was born.